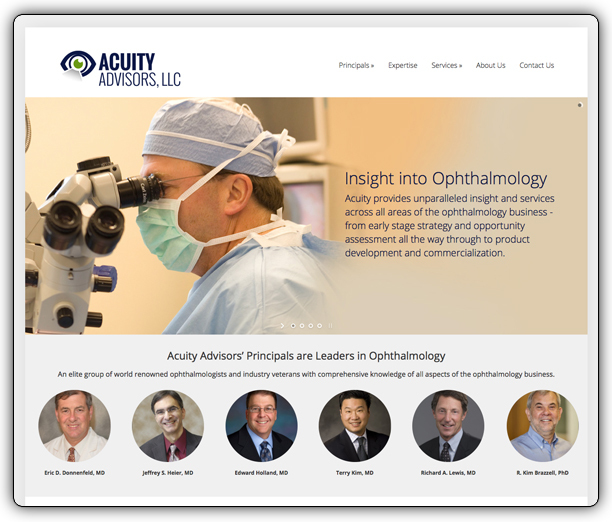 Acuity Advisors is an elite group of world renowned ophthalmologists and industry veterans with comprehensive knowledge of all aspects of the ophthalmology business. Acuity Advisors is backed by Lextias Pharma Services, Inc., an established contract research organization (CRO) that focuses on Ophthalmology, provides clinical and medical affairs operations and strategy in addition to back office support and business administration. IONA was called upon to create the digital experience for which Acuity Advisors potential customers and partners can gain more information about the organization and its offerings. 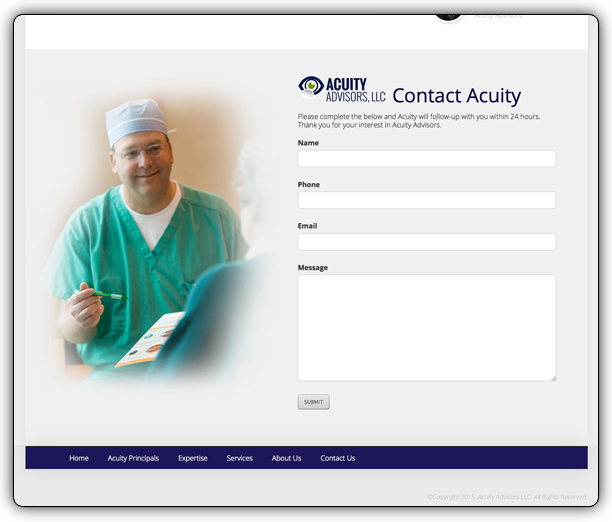 IONA created AcuityAdvisorsllc.com, a dynamically driven website that is managed by Acuity Advisors via a easy to use content management system. IONA worked with Acuity Advisors’ marketing director to ascertain the knowledge needed to create a site that would effectively communicate to Acuity’s potential customers. Through the use of a simple design that uses robust images of some of Acuity’s leading consultants, IONA was able to put a face to the Acuity name. 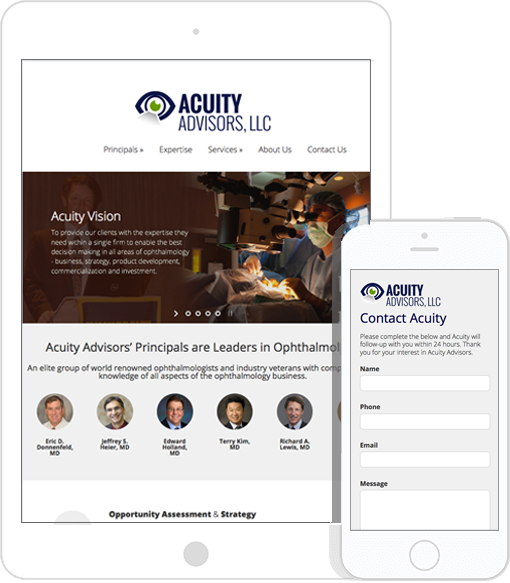 Unlike many consulting company websites, it is now easy to understand the clear offerings of Acuity Advisors and the faces for which will provide sound and profession advise. Mobility is everything for an audience of potential customers that are introduced to Acuity Advisors through trade show, industry networking, and face to face meetings. A unique digital experience that exudes the Acuity’s digital brand is created through the intrinsic details in photography, messaging, and content that intertwine and leave a user with the resounding uniqueness and clear understanding of what the Acuity brand is. A project’s success is defined through competitive analysis, strategy development, and goals and objectives. IONA works with each client to define these goals at the onset of every project to allow our clients to clearly see the return on investment in a digital project.